This time last week, we had just got back to the hotel after a long day of setting up our BETT stand. We sat in the bar, and considered that this year’s BETT could go one of two ways… Would it be like last year? Relatively busy, but full of visitors who weren’t quite sure what they wanted, and even if they did pretty sure they didn’t have any budget. Or would things have settled down a bit and we have a good show? The good news is that this year, BETT was full of visitors who came with a shopping list. They knew what they wanted, and how much they had to spend. In addition, the buzz that was at the show meant that visitors to the stand seemed much more interested in what we had to talk about. “…technology brings unprecedented opportunities for assessment. Teachers can now support pupils’ learning by assessing their progress in a much more sophisticated way, and sharing assessments with pupils and parents. 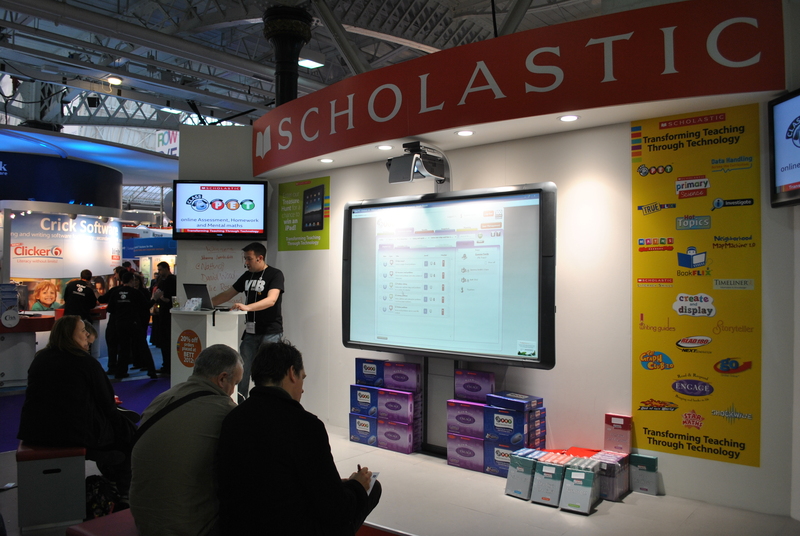 For Scholastic, with Class PET and Read & Respond Engage that do just this, and help with the revised Ofsted framework, this meant we had more teachers coming to our stand looking to see exactly what they do and how they could help. It meant that a lot of the demonstration schedule was rewritten to get both resources demo’d a bit more, and by Friday night my voice was more husky than someone who smokes 40 a day, and I hadn’t had lunch for three days. In amidst all of this, we had some astonishing TeachMeet Takeover sessions, and quite possibly even more impressive KidsMeet sessions. I honestly think that some of the demonstrations by primary school pupils from Ian Addison’s, Charlie Deane’s, Nick Jackson’s and Tim Handley’s schools were more slick than many adult presentations. Thank you very much indeed to all of the teachers, and pupils who presented on our stand. By Saturday night, I tweeted that I’d like to have a foot transplant. Apart from my feet feeling as if they were going to fall off, everything else seemed well in the world. Our teacher resources had sold incredibly well, Hutch (our caricature artist) had gone down well again, and we had so many leads to follow up that it has taken two days to sort them all out. A good BETT – and one that was a fitting end to it’s time at Olympia. ← BETT 2012 – what a busy week it’s going to be GREAT! Thanks for the comment Bjorn! It was a great show – I’ll write up the second post over the weekend!